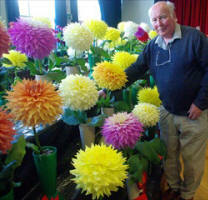 Considering the season this year with everything being late, the Midlands Dahlia Society Annual Show was excellent. The quality of exhibits, especially the Giants, was outstanding. 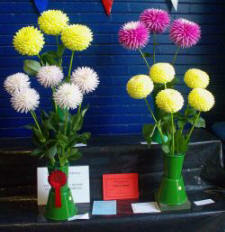 Prizes were spread around exhibitors and the number of visitors was higher than last year. 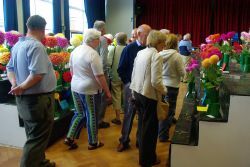 There were more exhibitors than last year and the number of entries was higher. When looking at the photos if you move your cursor ( mouse) over the picture then some will ask you to 'click to see larger photos'. Try this out! Ron Guest is Midlands Champion. The winning entry used: Kenora Challenger, Oakwood / Cherwell Goldcrest, Hillcrest Candy and Mary's Jomanda. 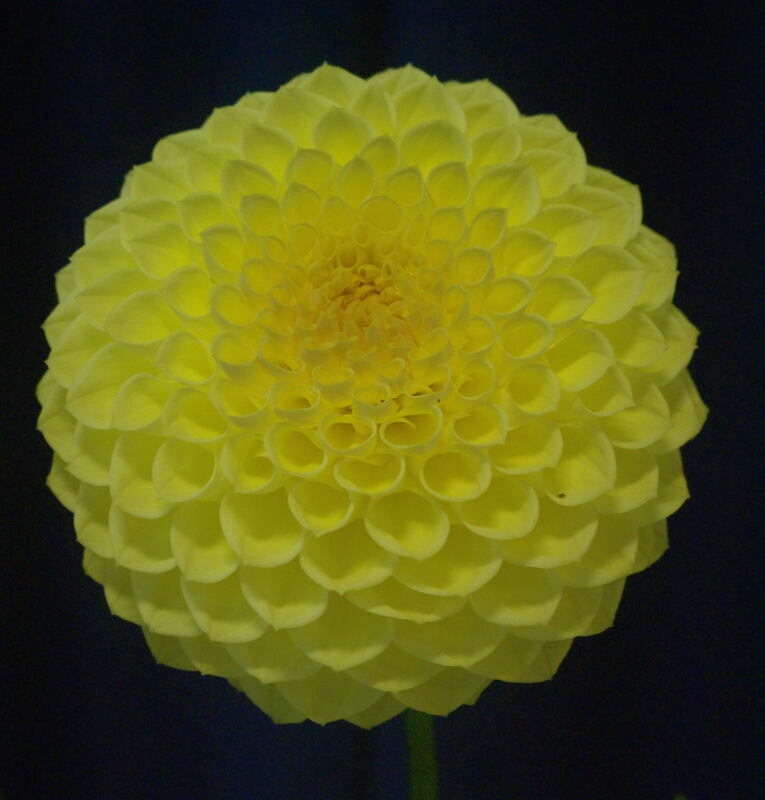 Ron also won the NDS Bronze medal and for the 2nd best exhibit in show and the S & E Braddock Perpetual Challenge Trophy for the best vase of Small / min Ball in show (Mary's Jomanda ). Frank Bolsover was second in the championship - photo left. 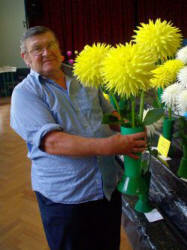 His vase of Kiwi Gloria gained him the Eddie Durrant Memorial Trophy for the best vase in show. Frank also won the The Elaine Fenton Trophy showing: Gateshead Festival, Oakwood Goldcrest and Scar Tango. See photo on the right. 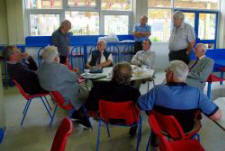 Ron briefs the judges, our thanks go to them for their efforts. 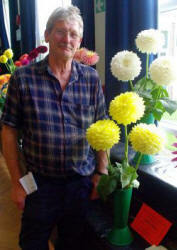 Tom Bebbington repeated his winning form from last year to win the Philip Damp Trophy for 6 Giant Decs. He showed Sir Alf Ramsey (x2), Bonaventure and Alvas Supreme (x3). 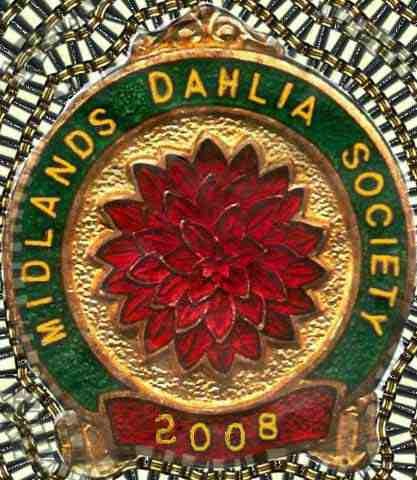 The NDS Silver medal was won by Dave Gillam with a vase of Gurtla Twilight. 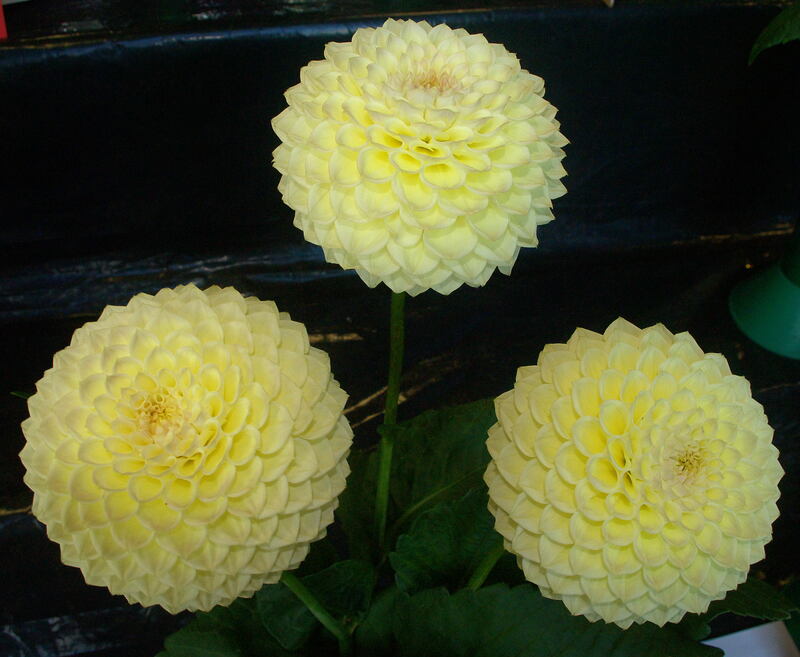 This vase ( photo below right) showed magnificent form, uniformity of blooms and attracted the attention of all the judges. 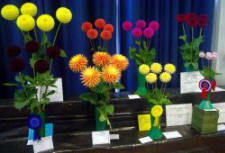 This also won the Violet Davies Premier Award for best vase in the show, the H. Dunkley Trophy for best vase of poms in the show. 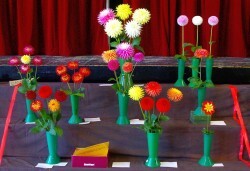 The vase of poms, together with a vase of Barbarry Pip, which had terrific form, won Dave the Stella Trophy. 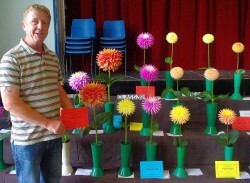 Even though Dave only had 4 vases of Poms and vase of min decs, he travelled the 350 miles to enter the show because he considers the Midlands to be a very friendly society. 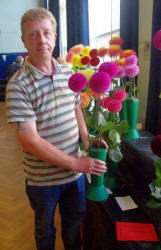 A vase of Willo’s Violet and two more vases of Gurtla Twilight saw Dave win the George Irvine Perpetual Challenge Cup. 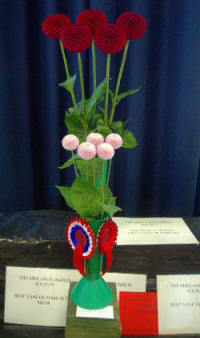 Frank Taylor came second in this class, winning the The Decorative Cup for his vase of Ruskin Diane along side a vase of Marston George. Paul Jee won the The Gordon Steel Trophy in a strong class of entries, showing Charlie Two and White Charlie Two. Jubilee Class - the public voted for Gabby's entry! 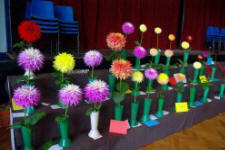 To celebrate the Queen's Jubilee, a special class was created for any 5 blooms, to be judged by the public. About 50 votes were made, the entry with the most votes was by Gabby Hayes, and is shown right. The Intermediate classes saw Rob Cheetham win the 72 Trophy for his vases of Toy Boy and Winholme Diane. There were more entries than last year - reflecting the move up from the novices. 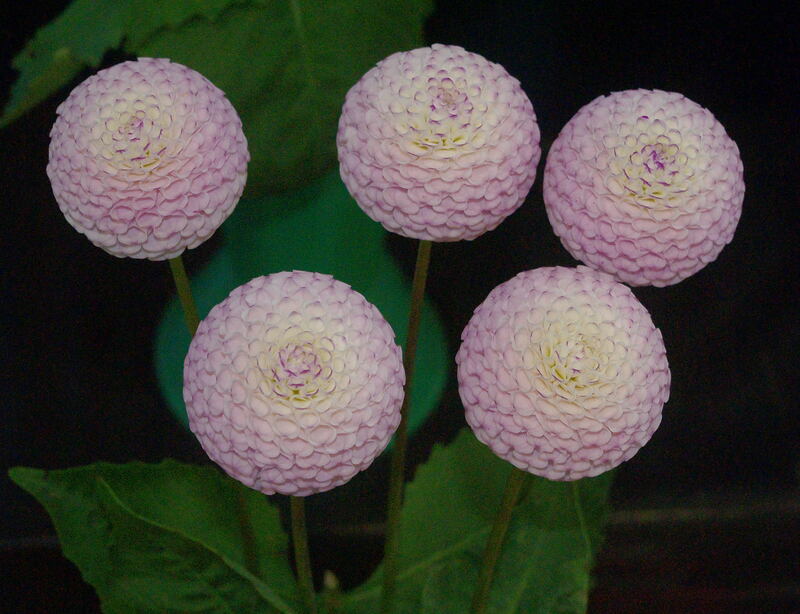 There was a good quality of flowers. 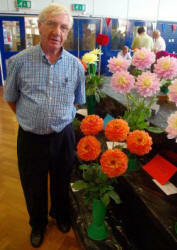 Dave Glassock won the large / giant dahlias with 3 blooms of Sir Alf Ramsey. The Giant Decs in the Members classes carried on from the open classes with Ian Hill keen to exhibit, coming down from Thirsk to win class 21 showing 3 Kenora Valentines. On the right we see Tim Williams with his Trooper Dan blooms to win class 24. In the Special Classes Gabby Hayes achieved his target of winning the Bruce Watson Trophy with his 20 blooms shown on the right. 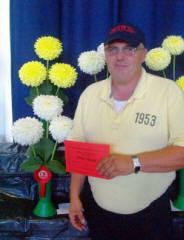 Cliff Wragg won class 46 - two vases waterlily, showing Bracken Ballerina and Shep's Memory. The Novice classes encouraged a lot of entries. 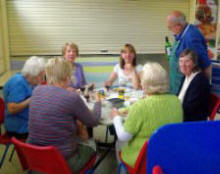 It is pleasing to see so many up & coming novices for the 1st time in a few years. The standard of entries suggests they may not be novices for long. 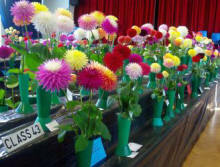 The high quality of blooms shows that advice from senior society members is working through! 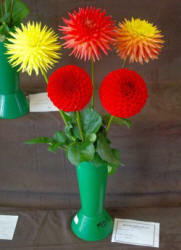 Winners included: Medium dahlia: Dave Glasock with Hillcreast Candy; Pompon dahlia: Kevin Hammond with Gurtla Twilight. 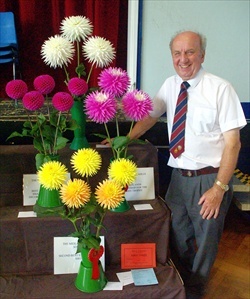 Mark Williams won the Giant, Small and Miniature novice classes. 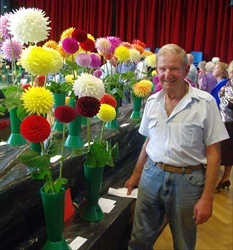 He won the Don Brawn Trophy for the best exhibit - his Winholme Dianes. He also won an NDS bronze medal. Surely this is the last time we see Mark as a Novice?! We must thank all members for assisting with setting up and closing down the show. Special thanks to Angie and team for the bacon batches & hot drinks early Sat morning as well as Bruce and his team for the lunches on Sat & Sun. 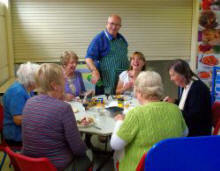 Bruce looking after his catering team - is he feeling all right? 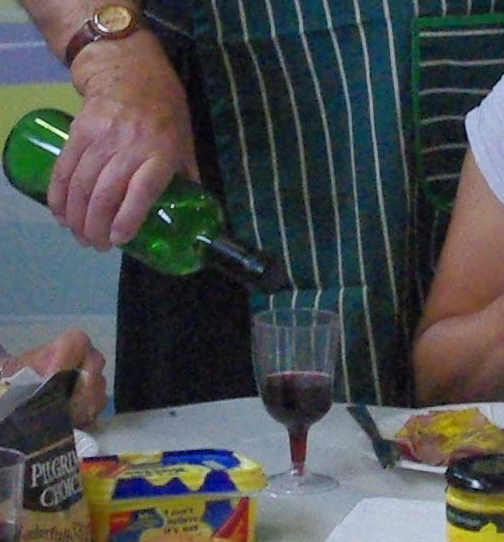 He must be - he's serving the wine, but is he? click on the photo to find out!